Las Vegas (AFP) - American Mickey Bey won the IBF lightweight title with a 12-round split-decision victory over former champion Miguel Vazquez of Mexico. Bey improved to 21-1-1 as two judges scored the fight in his favour, 115-113, 119-109, while the other had it 115-113 for Vazquez. Both boxers fought a close tactical fight at the MGM Grand Hotel and Casino in Las Vegas. They preferred to use their jabs and clinched often in the slow-paced bout, which was on the undercard of the Floyd Mayweather-Marcos Maidana world title fight. 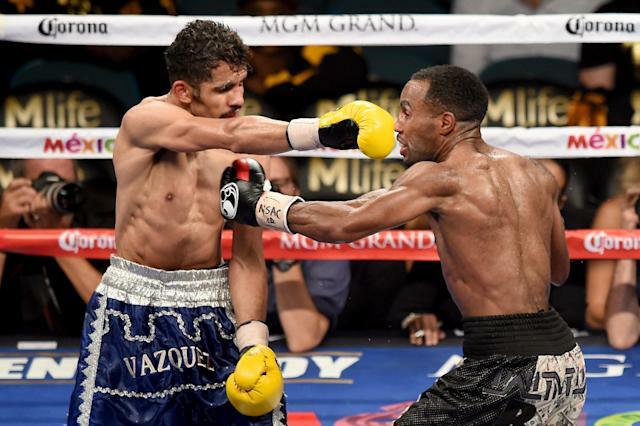 Vazquez was making the seventh defence of his 135-pound title he has held for the past four years. Vazquez was visibly shaken by the loss and appeared especially upset that one judge scored it 119-109. The 27-year-old Vazquez suffered a bloody nose in round three, the result of their heads clashing during an exchange in the centre of the ring. Bey, who is trained by Floyd Mayweather Sr, used his jab effectively but had trouble landing any solid combinations on Vazquez, because of the champion's unorthodox style. This was the first time in his career that the 31-year-old Bey had gone 12 rounds. He was coming off an impressive decision victory over Alan Herrera but Saturday's fight was much closer. Bey's win also comes 19 months after he tested positive for testosterone, which led to a three-month suspension and a $1,000 fine. In the semi-main event, American Leo Santa Cruz retained his WBC super bantamweight title with a second-round knockout of Mexico's Manuel Roman. Santa Cruz floored Roman at 55 seconds of the second round in the third defence of the title he won in August 2013.